Televangelist and Pakistan Tehreek-i-Insaf (PTI) lawmaker Aamir Liaquat on Tuesday issued multiple berating statements against the party's senior leadership including Prime Minister Imran Khan, voicing concerns that the representatives from Karachi were being allegedly sidelined. Liaquat launched into a tirade against the party during a talk show on Samaa TV. He complained that Prime Minister Imran Khan did not nominate anyone from Karachi and completely ignored the province for the post of Speaker and Deputy Speaker. When asked what the premier should do to address his grievances, Liaquat said: "They [Pakistan Tehreek-i-Insaf] have no movement in Karachi. The 'winds of Imran Khan' were blowing in Karachi which brought them success in certain constituencies, while in others certain personalities secured victory for them." "I told Imran Khan we need to focus on forming a concrete movement for Karachi at ground level because local body elections are to take place after 17 months. If you want to win, you will have to work on the union council level," the MNA said. He protested that the government is not extending the lease for Martin Quarters, complaining that the people of Clayton Quarters were forced to live under the open sky. "Moreover, the residents of Press Quarters lost their homes today as they were torn down, while the people living in FC Quarters are in utter despair," he maintained. Here the show host pointed out, "But isn't it true that PM Khan has said he feels the pain of Karachiites and is even fielding a candidate of presidentship from Karachi?" On this, Liquat flew off the handle and said: "Was Mamnoon Hussain from Lala Musa? Was Pervez Musharraf from Jhelum?" "What a strange point you have raised," he said rebuking the show host. "This is [tantamount to] throwing dust in people's faces if one says 'he [PM Khan] is bringing a candidate from Karachi'," he said in vexation. "What begs more attention than 'austerity' is the fact that you dig out all the money sitting comfortably in the bellies of thieving crocodiles who have stolen it," he asserted. "Saving costs on '18 cars and teacups' will not bring about simplicity," he said disdainfully. "Feeding people is a tradition of the Prophet (PBUH). No one was left with an empty belly from the Prophet's home," he said while criticising the austerity measures announced by the PTI government. "For now, they should bring their own house to order and address the grievances of their own who are unhappy." When asked by the show host who else is unhappy besides him, he responded while chuckling: "You think I am so naive that I would tell you how many people I have who stand with me?" He went on to steer the conversation back to the issue of Karachi, saying that the city had been sidelined. "I was not invited to a meeting held by the Sindh governor today. Imran Ismail sahab did not invite me." Liaquat said that stories alleging that he [Ismail] did not have my number were concocted whereas "just one minute prior to coming on your show I was on the phone with him". "He [PM Khan] is not ready to talk on these basic issues because 'I am a stranger and an outsider'," the PTI lawmaker claimed, convinced that he was being ignored due to his specific background. The show host then pointed out that many people were from the outside including the Punjab Assembly Speaker, to which Liaquat responded by saying: "There is a lot of difference between those outsiders and this outsider." The host interjected by saying: "Imran Ismail brought you into the party's fold himself with a lot of affection." "I am not going to say anything to Imran Ismail, however, I will say about Faisal Vawda, who has given a beeper on Samaa TV, that he should keep his wits about himself. "He [Vawda] said we don't take Aamir Liaquat seriously. Well, you will soon take me very seriously," warned Liaquat. "Take care of your own food and your life. Worry about where you are eating nowadays," he continued to warn Vawda. "I am saying all this to him [Vawda] 'between the lines' because given what he has said I could have responded with much more than this but I do not wish to drag this matter any further than this." When asked if Liaquat plans on "moving left or right" the show host was told that there was no question of such a thing. "I will remain in PTI and its Karachi chapter," said Liaquat resolutely. Televangelist and Tehreek-i-Insaf lawmaker Aamir Liaquat on Tuesday voiced concerns that the representatives from Karachi were being allegedly sidelined. He wouldn't be from Karachi would he? It seems early members did not start the PTI in Karachi. Imran Khan is a poor judge of people’s character. First Buzdar and now this. An opposition within. What this guy is trying to achieve here. Its a mystery. He is not a trustworthy guy. Valid points coming from anyone should be considered. And if there are any in AL dialogue here govt. should look at it seriously. That said, this guy cannot be trusted for anything. Taking him in PTI was not a wise decision. Missed Sindh governor post ? He has a track record, please be aware of it. They guy has always been a joke. Amir Liaquat who. Mr. pretending to be holly, what have you done for Karachi Amir Liaquat other than pretending on TV to be a big shot. Aamir Liaquatknows well that he has to face music soon when he has to appear in SC that is why he is trying to make this fuss. Its one thing to raise issues affecting common people and its another in the manner in which he does it. Drama queen tactics don't suit anyone. We all must remember that many political personalities such as Amir Liauqat were part of political parties which were given mandate either through rigging or corruption, even then they did not do anything for their constituencies. Rather they were mainly filling their own pockets with money. Instead of criticizing he should be patient and listen to his new party's administration. But I think he joined the party for other reasons, other than serving people. Which they never did in the first place anyway. MQM was and still is responsible for many killings, robberies etc. They are the one who gave ammunition in the hands of very young people and rules the city with BHATTA and Badmaashi. The whole world knows it. Amir is good at at talking and that's what his job is actually. Let him talk and let people find the truth themselves. He is going to have a minister portfolio soon.Initially there were rumors that PTI was not granting him NA ticket. He appeared on TV show and made similar remarks and soon got that ticket. PTI knows they have to keep this person happy otherwise he knows how to make other disgraceful. Big challenge for PTI. As usual, Aamir Liaquat is making unjust noises, because he got no post in the government - he has in the past proved unreliable, indecisive and publicity seeker. This is why it is said that leopard doesn't change his spots. A lose canon, who is throwing up dust just to get attention. The issues Pakistan is facing are beyond, karachi, Sind, Punjab. The debt, corruption etc left behind by previous governments affects whole nation. He is partially right.karachi representation from pti is zero from the cabinet he selected. Faisal Vawda is another character! PTI government is off to a very bumpy start, seems more like a college union than a country’ government, woring about kitchen expenses, all talks, nothing impressive so far. Supreme court is already taking up his case to disqualify him from MNA. His ego has no limits! Just coz he is famous he thinks, he should be given the command of PTI affairs in Khi. Seems like he wants to be in limelight at any cost. He need ministership.. or he will resign. He's desperate for a big post! He is the Fazlurehman of PTI. This guy is another Fazlu, quiet till he has a bone. @Imran politics makes for strange bedfellows. the americans elected a poor president too. real leaders are very rare. IK must choose from Pakistanis. karachi was run by the MQM and Sindh by the PPP, blame them for failures, then move on. This guy is trouble. He wants the limelight. He is old Pakistan . Stop ranting against Imran Khan and go after the PPP Sindh government. PTI members who won from Karachi got nothing in the federal parliament but MQM members from Karachi got the federal ministerial positions. Amir Liaquat does have a point. I wish that should help people see what kind of justice people of Karachi are going to get. he is cost of doing business!. he will be kicked out of or leave PTI soon!.when he feels neglected he opens his mouth.it was a good move to let him in the party to get a seat in Karachi,but he is expendable now. PTI will win his seat in by election when he leaves! Imran khan did mistake by chosing Amir Liaqat. He can never bhe trusted. The phenomenon is not new, historically every ruler neglected, forgot, betray, just no one care for Karachi and Karachiites, obviously due such step mothers & step fathers prejudices our own, my own, Karachi garlanded by 137th rank amongst non-livable metropolitans. The claimants & champions of democracy mercelessly looted & plundered the nation’s wealth, and left nation in high inflation, no investments,and just add ‘ no’ to every service. Dr Amir Liaquat is in haste, but atleast he must give some time to PM Imran Khan, let him correct the mess one by one. Let things move in an orderly manner. @Life no mystery, he is an instigator, this is how he has been running his phoney career. The PTI government has just taken over so Amir Liaquat should not blame its leadership for neglecting Karachi? If he wants to blame anyone that should be PPP and MQM governments of which he was also a part, for not just neglecting Karachi, but looting and plundering it by land grabbing, water mafia, kidnappings, bhatta and money laundering. Not to mention severe water shortage, lack of public transportation and mountains of garbage all over. The PTI government will end all such failures of other parties and serve not only the people of Karachi and Sindh, but the entire country. Amir Liaquat needs some rest and a holiday. And the trouble for PTI has started with sobrity and with Liaquat. A liability, he will remain a liability until he is paid off. And that is what Mr. Liaquat is pleading for. Nothing wrong if he is criticizing his own party as long he is being informative and constructive. Don't think that IK will mind because how else IK will find out shortcomings in his government? This man is drama queen and not trust worthy. Even supporter of PTI don't like him. It's coming. Have some patience ..
now PTI in power barely few days and he is already causing a rift..maybe planted as was javed hashmi ??? !! has he talked with IK directly to raise his concerns??? It has not been two weeks since the government was formed and there is dissent among the ruling party already. KP chapter, and now the Karachi issue. Now that these people have won the elections riding the PTI wave, they are bringing their own petty interests and agendas to the fore, instead of a collective approach towards problem solving. If this continues, nothing is going to change. Personal interests will take precedent over national interests, and we will remain stuck in the same quagmire that we want to get out of. He wants to become the new leader of Karachi. But Imran Khan must order for re-census in Karachi as the result of the census was a complete fraud. He should work to make small administrative units including Karachi and Hyderabad, and work for the presidential system where the president will be directly elected. He shouldn't have been allowed in PTI to begin with. PTI's Karachi chapter has been struggling since 1996. That makes it 22 full years. Mr Liaqat cannot expect to be given the limelight he is used to on TV channels. This is where one has to say "I told you". Please see below my comment when Aamir Liaquat joined PTI. 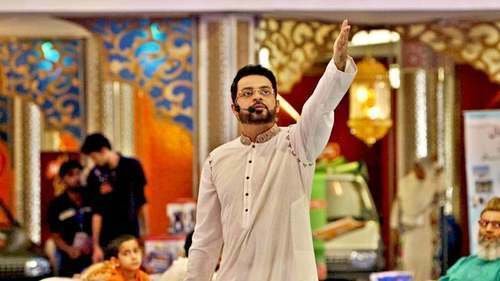 "People genuinely dislike Aamir Liaquat. He has no public support. Infact thousands will not vote for PTI just because of his inclusion as he has hurt sentiments of thousands with his careless and ruthless comments. Two weeks before he was included in PTI he was accusing Imran Khan of not having any leadership skills and passing derogatory comments about Imran Khan's personal life. Just wait for the day when he leaves PTI and starts passing negative comments as he has done to all media groups he has left. Inclusion of Aamir Liaquat was the darkest day in PTI's political history". Aamir Liaqat's face is a true face of a traitor, living within and eating the very same roots that feeds them. The best revenge for people like him is to not let them have our time. Change your channels when he shows up and soon he will be an un desired commodity. It's interesting. He is forgetting that one of his fellow MNA from Karachi is PM of the country and another is about to become the President. If his argument is that PM is not a Karachiite then a Karachiite not elected from Karachi is Finance Minister. He has a valid claim that PTI government is in place because of Karachi but he didn't explain his contribution to this phenomenon before taking role of Karachi spokesperson. It's great of Karachi that it even voted for him to elect a PTI MNA. In the end I rather agree with him on his views about Mr. Faisal Wawda. Look who is talking. He knows how to stay in the news. He is absolutely right for once! All key positions are filled with no representation from Karachi!!!! Name one person who takes this guy seriously. @Imran I guess he should learn from you,Nawaz Shrif or Zardari!. when you are trying to build a house sometime you need dirt too!. To let him in to PTI was a bad idea to begin with. Whatever his agenda, he should have discussed it internally and resolved it instead of talking on a TV show just 10 days after PTI has been sworn in. If PTI can do without him they should. This man should be expelled from the party! PTI will face challenges from inside not outside. There many blacksheep there.... Like this FAKE doctor. @M. Emad .No Absolutely no. He’s talking about Karachi & Karachiiites, not about himself. @Saad Really? I guess if you don’t count the president, the governor, the finance minister, the law minister, the IT minister, the Accountability Advisor (a cabinet position), then Karachi is under representated. Out of 21 Federal cabinet positions, if done proportionally (22 million out of 220 million), Karachi should’ve gotten 2 cabinet positions; they have 4 so far. I think Amir Liaquat is not a man anyone should trust. He is only good at throwing mud at people. Good thing he showed his colors within a week. I would not like to see his face ever again. It is good you are discussing your concerns about Karachi. Be honest, be fair in criticism and convince your associates for help. Or did they neglect him? @Life no mystery he needs a ministry and i think has been offered a olive branch by Zardari. This is the last horaa for him if he makes a mistake. Sure, PTI leadership is neglecting Karachi. Could you tell me, for how long they have been in power, at the centre ? And for how long, MQM and PPP were in power in Karachi ? PTI don't even have the hold of the city government or the provincial government. And could you also tell, from where does the nominated president of the PTI belong. And how many top jobs from the other urban centres ? How many from Lahore ? how many from Peshawar ? How many from Quetta ? How many from Bahawalpur, Faisalabad, Hyderabad,... ? He is shouting because, he didn't get a juicy position. Those who live in glass houses should not throw stones. You Aamir Liaqat have a foul tongue, as such you not fit for any position in the Government. @Lahori kid - you need to improve your comments. Only party concerned with Karachi is MQM. PTI, just like the rest of Pakistan just use and abuse Karachi for their own needs. Karachi along with Hyderabad needs to become its own province. Now PTI have to pay the price for giving party ticket to Amir liaqat . He is an opportunist , how many tv channels he has changed up till now ? . What a PTI, Cracks open up within days of assuming power. mr. liaqat is a very shallow individual, it is not going to happen overnight. For heaven sake the Govt. hasn't been in even for a month...this guy wanted to be a minister... that's the crux of it. Aamir liaquat should be expelled from the party as he is not a stable and sensible person. Will bring shame one day. And that day might be very near. If you want to win, you will have to work on the union council level. I have seen his videos on YouTube where he casually uses four letter Hindi / urdu words for mother/sister abuse. Imran must have been aware of it when he took him in Even though he is a televangelist, he doesn't has a holier than though attitude and because of his happy go lucky approach ,he has his own constituency. So ,it would not be so easy for Imran Khan to sideline him or gag him. PTI must take disciplinary action against this person who openly criticizes leadership of PTI on TV. Imran might be a different person than all of the other politicians in this country but everyone below him is the same old corrupt thief that has been recycled from PPP, PML-N etc. What sort of tabdeeli can these crooks bring? Just because they are under the banner of PTI doesn't mean they're clean. Instead of talking to the media why dont he visit imran khan and inform him about whats going on in karachi. Also remember, you won this your seat because of PTI not by your own. hes just an attention seeker!!! Mr. Aamir Liaquat is a man of no importance and he has always tried to remain in headlines through his controversial feeding. The PTI Chapter in Sindh is blackmailing IK and has limited his attention only to Karachi leaving aside the whole Sindh. It is for this reason that PTI did not get any visible rising in other parts of Sindh, except Karachi. In fact, if PTI is sincere and wants to grow to true national level, it must put the indigenous people on the driving-seat in Sindh. as has been done in other provinces of Pakistan. It can be seen from the composition of the current cabinet, which hardly reflects national cohesion and harmony, which is indeed dangerous and it must be avoided by PTI. PTI chairman and prime minister of the country is merely ignoring ten to twenty percent of the population of the country while he focuses on the remaining eighty to ninety percent. After all their votes will decide his and his party's future. Karachi and its people can be ignored as before since they do not matter to the powers that be. He(Liaqat) is an opportunist who should be kicked out of PTI. Dear Mr Aamir Liaquat, why dont you join the MQM back? you ditched them in the first place for opportunities elsewhere and now you claim that you are being ditched due to your certain background? as the saying goes...."what goes around, comes around" !!! Now, FACE THE MUSIC!!! @Mian Shoaib ..... in other words, he's will be a constant pain in the neck for PTI !! PTI should take disciplinary action against him. These are the first few days of PTI govt and Imran Khan is so busy with many things and he wants the PM to give him attention and forget important matters and meetings. He is like a lil girl seeking attention. We should vote for honest and people with integrity (without regard to party). People were forced to vote for Amir Liaqat as he was on PTI ticket. Never again! And PTI really needs to work on who is joining their party. Party office holders should have a history of commitment to the ideals PTI claims to stand for. The situation is sad and depressing. @Mrs.khalil "Now PTI have to pay the price for giving party ticket to Amir liaqat . " PTI desperately needed to be in government this time. And for that, PTI desperately needed to win from Karachi. They had to take over Karachi from a party that won almost all seats in every election. They did it and Amir Liaqat is part of what made it happen. Of course you pay a price to get what you desperately need. Karachi should no more be considered as a gift, it should be earned. If PTI can't own Amir Liaqat as he is, it cannot own Karachi as it is. Karachi is not a bed of roses, ask MQM for further details. Amir Liaquat should be kicked out of the PTI. He is a great opportunist and blackmailer.The same tactics were used by him at the time of distribution of tickets.Now he is blackmailing Imran Khan for the post of Minister.It would be better if Imran Khan gets rid of this fellow as soon as possible. This is the result of embracing a bad egg. This guy is master of hocus pocus. He is blackmailing PTI for ministership. And I believe no matter what he does, his aspirations will never be met. @Mian Shoaib if he becomes a Minister then it will be all downhill for PTI. The very fact that IK inducted this character into his party and gave him a ticket, speaks about IKs judgement and vision. Not impressive. I wonder why TV shows and anchors invite this half educated man to hear what profound insights from him? Finally, someone to challenge IK from with-in the party. Aamir Liaquat accuses PTI leadership of neglecting Karachi. another Altaf in the making...misusing Mojhairs desperation to be used for his personal inspiration...Know the difference between principles based on right or wrong vs. principles based on personal gain, and consider the basis of your own principles. @Life : Aamir Liaquat is the next Fazl-ur-Rehman of Pakistan. Once a crook, always a cook. Mr. Aamir Liaquat here it seems is joining the ranks of the opposition by being impatient rather than standing by the party ranks. He should be contributing on resolving the issues of public at large instead of cribbing about trivial matters such as "I am being sidelined in the party" or "I was not invited to the oath ceremony". These matters should be taken up internally within party with respective stake holders rather than media. @khanm "Aamir Liaquat accuses PTI leadership of neglecting Karachi. another Altaf in the making...misusing Mojhairs desperation to be used for his personal inspiration". PTI accused MQM leadership of neglecting Karachi. another Altaf was in the making...misusing Mojhairs desperation to be used for personal inspiration. This is how PTI conquered Karachi. What goes around, comes around. @Ashley Keep your friends close and your enemies closer. I think this was the reason this big mouth was given the PTI ticket. He is so hasty. Always looking for cheap publicity. IK must be regretting taking a fraudster like Aamir Liaquat in PTI. @Javeed or maybe PTI is an opportunist who gave him party ticket. There is no question Imran Khan will look back and say this may have been his biggest mistake to allow this phony to join PTI. Why was this man given a PTI ticket/membership? He should please be thrown out immediately. Its interesting to see such an outpouring of comments from critics of Amir Liaquat whenever there is any news related to him. I wonder if this is a selective group of few individuals that does this. Amir Liaquat despite all these comments is watched and admired by hundreds of thousands. His followers on twitter account for over half a million. That says it all. The Electables that IK loved so much. @Ayesha Sadozai "Why was this man given a PTI ticket/membership? " Because he was desperately needed. What else?